For the first time in my many trips to London, I made the journey to Abbey Road to take my own photos of the famous "zebra crossing" featured on the Beatles' album of the same name. It seemed easy - and harmless - enough: take the Underground to the St. John's Wood Tube station, walk about three blocks west, snap a few photos, and I'd be set with my own version of the Abbey Road album cover. Even before you leave the Tube station, the hawkers assault you with signs inviting you to "visit our Beatles' Memorabilia" shop, etc., etc. Ignoring those, I walked past and headed west, following my Google map directions and hoping the throngs with whom I was sharing the sidewalk weren't heading the same place I was. There were literally at least a dozen of us vying for that one vantage point on the west side of Abbey Road that would allow us to recreate the familiar album cover. Those with friends in tow co-opted them into either taking pictures or posing on the crosswalk, while less-than-amused locals used their car horns liberally to make it quite clear they didn't think it was all that cute. Mercifully, it was over quickly. We all know the shot and, whether in front of or behind the camera, we all knew our roles and we played them well. One take and we were done. 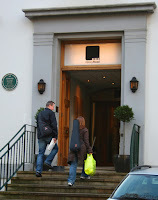 But spend a few more minutes and you'll see that the Abbey Road Studios are much more than the namesake of a 40-year-old album (dare I say "LP"?). In the few minutes I lingered outside its wrought-iron fence, at least a half-dozen people carrying musical instruments made their way through the front doors and, presumably, took their places behind microphones. Were any of them future Beatles? Not likely. But in their own way, they're adding to the universe's musical catalog and, in some small way, are leaving a legacy that someone several generations hence may enjoy, much as many of us still enjoy the Beatles' music, even though John and George have been gone for years. The realization that these anonymous musicians may have created a legacy (modest though it may be) that will outlive us all made the side trip worthwhile. Click on photos to view larger size. I love your blog. Your info is great and insight wonderful! THANK YOU!